The secret is in the weave. This unique flannel is created with tiny fibres that have been split into millions of finer fibres that are no thicker than one hundredth of a human hair. Using a unique weaving process, each flannel consists of tens of thousands of tiny storage compartments that lift the dirt up out of the pores, trap the waste and leave a clean surface. The nylon core within the fibre form tiny edges that break up surface dirt and easily absorb and remove oils and dead skin cells. The only cleanser you need is water! Yes. Used as directed, the Dermaflannel is gentle and will not irritate your face as other chemical exfoliates might. It is recommended that only light pressure be used in order to prevent irritation. The flannel is very abrasive so must be used lightly, also avoid using the flannel around the eye area. The Dermaflannel can even be used to treat acne and other skin problems during pregnancy since no chemicals are involved. You will feel the results instantly; your skin will feel softer and smoother. After approximately a week of regular use, blemishes will start to clear, the skin will look healthier and you will just notice how clean and fresh your skin is. After approximately four weeks the skin will appear firmer, blemishes will be fading, fine lines less noticeable and pores will be shrinking. The results will just keep getting better and better with each use. How will the Dermaflannel help my skin complaint? Dull/Flaky Skin The dermaflannel safely exfoliates the upper layer of your skin, which is called stratum corneum. This is the whole purpose of costly salon micro-dermabrasion treatments and chemical peels (glycolic acid, salicylic acid and enzyme peels). Skin exfoliation is a naturally occurring physiological process; dead surface skin cells naturally slough off and reveal new skin cells. However, natural skin exfoliation sometimes needs assistance. For example, when the skin type is oily, the skin has difficulty exfoliating or sloughing off the dead skin cells. Equally, dry skin types are prone to a dull, grey appearance and dead skin cells will hinder the absorption of moisturisers. Blackheads Scrubs and washes don't help with blackheads because the particles of the products are too big to reach within the pore, no matter how tiny the scrubbing beads are, they're just too big to make a difference to the blockage. Because the fibres of the dermaflannel are so small, they can effectively reach within the pores to help break down the blackheads and eventually remove them, when used daily you will see a noticeable improvement in blackheads in only a matter of weeks! The flannel is also abrasive, allowing thorough exfoliation of the skin which prevents the pores becoming blocked again with dead skin and excess oil. Fine lines and wrinkles The intense exfoliating action of the dermaflannel allows you to effectively "rub away" your fine lines and wrinkles while also purifying the skin, the result is instantly smoother and softer skin that glows with radiance as the dull, dead skin cells are removed. Nothing removes wrinkles in one use of course but with regular use, you will achieve a smoother complexion. Pigmentation/Brown spots The dermaflannel helps to deeply exfoliate the skin and removes the "stain" from the surface of your skin. When treating pigmentation it is essential to protect the skin from the sun, do not sunbathe and always wear an SPF, UVA and UVB rays will make pigmentation worse. Although the dermaflannel can help to reduce the marks, if your skin is prone to pigmentation it won't stop the process. Can the dermaflannel be used on young skin? With parent supervision yes. Children as young as 8 can experience skin complaints which can be traumatic, but as the flannel is very abrasive and can easily be misused, we recommend anyone under the age of 17 be supervised by a parent to ensure the skin isn't over exfoliated. Use the product gently, once or twice a week and ensure that your child wears a suitable SPF daily. Yes. Used as directed, the Dermaflannel is gentle and will not irritate your face as other chemical exfoliates might. It is recommended that only light pressure be used in order to prevent irritation. Also avoid using the flannel around the eye area. The Dermaflannel can even be used to treat acne and other skin problems during pregnancy since no chemicals are involved. A slight pinkness may occur due to the abrasive nature of the Dermaflannel but this is dependent on your type of skin and its sensitivity. Some people may experience slight flaking of the skin in the several days after treatment. This is normal and means the process is working. Flaking and peeling should minimise with subsequent treatments as your new, healthy skin emerges. Can I use it for other parts of my body besides my face? 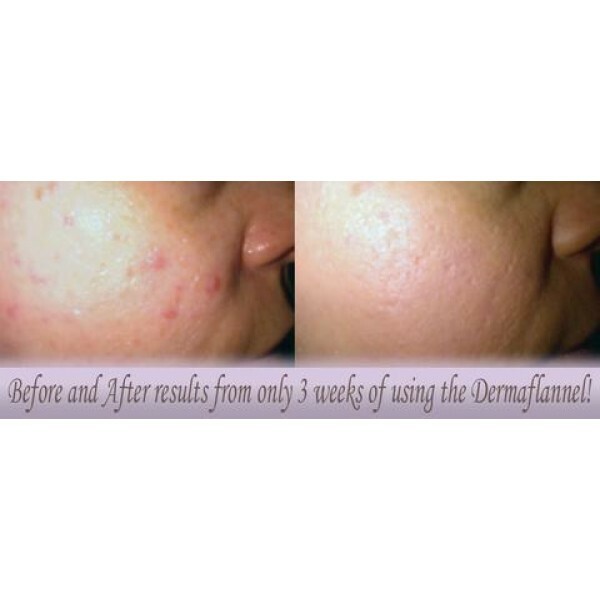 The Dermaflannel can be used on your whole body, including back and chest acne, dry, sun damaged skin on arms, legs, etc. with the same rejuvenating and skin clarifying effects. This is an effective way of reducing in-growing hairs and Keratosis Pilaris. Your flannel will come with full instructions of use and if you have any further queries, we are only an email away. Hygiene is very important when using flannels as they can harbour bacteria, the flannel can be washed in your machine on a gentle cycle (do not use fabric softener) but we have found that hand washing prolongs the life of the flannel. Use a medicated wash and clean the flannel at least once per week, preferably after each use. Always be sure to hang up the flannel so that it dries properly, if the flannel is left crumpled and damp bacteria will breed. 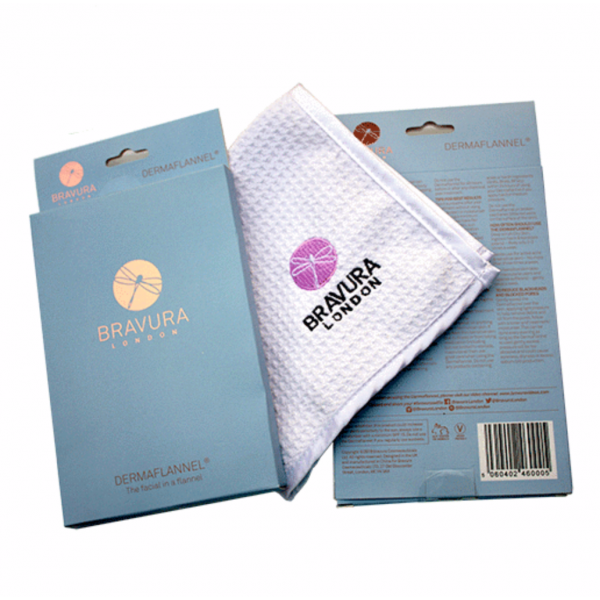 Avoid storing the Dermaflannel on a hot radiator as the heat could affect the microfibres. Avoid using close to the eye or genital area. When should I NOT use the Dermaflannel? You should never disregard medical advice or delay in seeking it because of something you have read on this website. If you suffer from any systemic disease or dermatological disorder that affects your skin please advise your doctor before use. You should also avoid using the flannel if you are sunburned; have active herpes simplex, open cuts or sores, are currently on a medication (included but not limited to Accutane) or have recently had facial surgery. Still not convinced? Please remember that Bravura has an excellent reputation for supplying top quality products that work, we don't rely on gimmicks. The Dermaflannel is simply a revolutionary new product. Break the mould, don’t follow convention and try this magnificent product today, we guarantee you won’t be disappointed! !